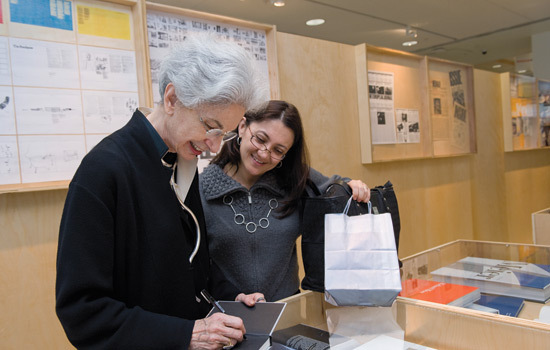 Lella Vignelli gives an autograph to Paulina Garcés Reid, a 2002 graduate of RIT’s graphic design program. Massimo Vignelli describes it as a dream in gestation for nearly 30 years. 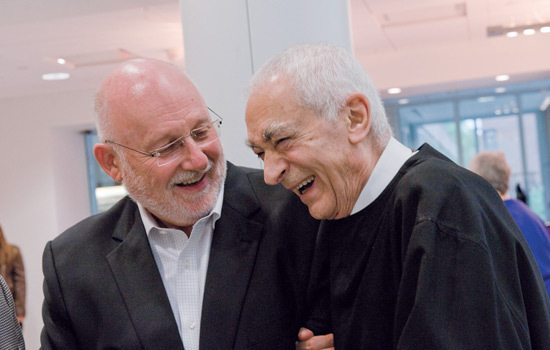 The world-renowned modernist designer finally witnessed the birth of that dream Sept. 16 as RIT officially unveiled the Vignelli Center for Design Studies. 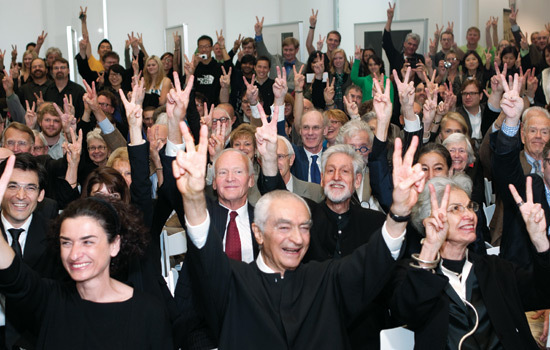 Vignelli and his wife and design partner, Lella, spurred the creation of the center by donating their archives to the university to allow future generations of designers to study and learn from their work. Family, friends and colleagues of the famous modernist designers flew in from Italy, Germany, New York City and Los Angeles to attend the dedication ceremony. The 19,000-square-foot facility is adjacent to James E. Booth Hall. The center’s architecture, comprised of two geometrical cubes, one made of glass and one made of brick, symbolizes the modernist, simplistic design philosophy of the Vignellis. The construction project cost nearly $4 million. The glass cube features exhibits of the couple’s corporate identity campaigns, including their work with Xerox, American Airlines, Bloomingdales and Ford Motor Co., furniture, silverware, glassware, and some of their other product designs. The work is on display in the Benetton Gallery. The brick cube houses the Vignellis’ extensive archive. The archives will allow students, visiting scholars and professional designers hands-on access to the Vignellis’ original source materials and finished products. The archives will supplement RIT’s curriculum in programs such as graphic design, industrial design, interior design, 3-D digital graphics, new media design and imaging and computer graphics design. In addition to the building and the archives, the new center will spur educational programming initiatives, including conferences, a guest speaker series and a future master’s degree program in design studies. For students, access to the Vignellis’ archives is a privilege. Cassandra Angerosa, a fourth-year graphic design student from Utica, N.Y., spoke at the ceremony on behalf of the school’s student body. Overcome with emotion at times during the ceremony, the Vignellis too are sometimes still in disbelief. 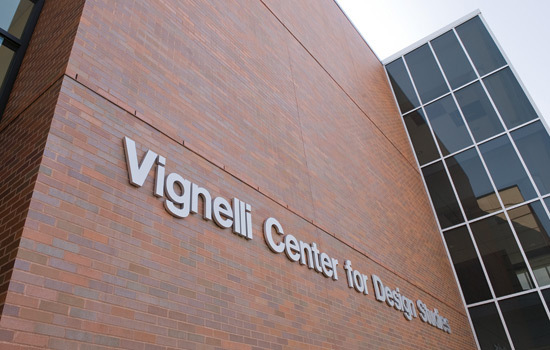 Exterior shot of the Vignelli Center for Design Studies.